I'm so excited to bring you, along with My Merry Messy Life, Earning-My-Cape, and Tutus & Tea Parties, A Crafter's Dream Christmas Giveaway! 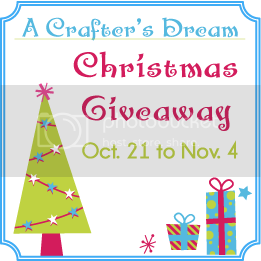 This is a group giveaway opportunity with a Christmas, crafting, and supporting small business theme! Each blogger is offering her/his own giveaway worth $25 or more. It will run from October 21, 2012 to November 4, 2012 and bloggers, as well as shop owners, are welcome to sign up to join in the celebration. Bloggers who are not crafters and shop owners who are not bloggers can still join the giveaway by pairing up together! If you need help finding a shop or blogger to link up with, we will do our best to help. Christmas is just around the corner, and the time to start crafting our gifts for friends and family is now! Some of the blogs in the giveaway group will be giving away some awesome crafting supplies! Sometimes we want to give a handmade gift, but just don't have the time or know-how to make them ourselves. This is a great opportunity to support small businesses and shops who offer handmade items! Some of the blogs in our giveaway group will be highlighting such small businesses and offering giveaway items for them, as well. Even if you don't win the giveaway, we hope that you will keep these small businesses in mind when shopping for that perfect gift for your special someone. Each blogger will run their own unique giveaway, worth at least $25 or more, on their own site using Rafflecopter as the entry form. Please set your Rafflecopter to start at 12:01am October 21, 2012 and end at 12:01am November 5, 2012. You have total control over what you would like to give away (as long as it ties in with our Christmas/craft/small business theme) and to whom (country). Please announce that you have joined on Twitter using this hashtag - #ACraftersDream, and/or make the announcement on your Facebook Page. Please write a post announcing you have joined the giveaway, and include the html from the form that you will fill out. Grab the giveaway button and put it in a prominent place to promote it on your site! The more bloggers who sign up, the more entries we ALL get! You can team up with a blogger on your own, or we can help match you with a blog to sponsor with a giveaway item worth $25 or more, from your shop. Please fill out this form if you would like help being paired up with a blog. Bloggers, please enter your blog link below.